Banamine Paste is a potent non-narcotic, non-steroidal analgesic agent with anti-inflammatory and fever-reducing activity. Banamine paste is recommended for the alleviation of inflammation and pain associated with musculoskeletal disorders. Banamine requires a prescription from your veterinarian. How does Banamine Paste work? Banamine (flunixin meglumine) is an analgesic, which means it relieves pain. It's also an antipyretic (fever reducer). Tell your veterinarian if your horse is using any other anti-inflammatory medications, such as NSAIDs (phenylbutazone) or corticosteroids (dexamethasone). Side effects include localized swelling, sweating, induration, and stiffness. In rare instances, fatal or nonfatal clostridial infections or other infections have been reported. What is the most important thing I should know about Banamine? Banamine is an analgesic and anti-inflammatory medication. It is available 100 ml multi-dose vials containing 50 mg/ml and as a Paste in an Oral Syringe containing 1500 mg/30 gm Banamine is used in horses to alleviate pain and inflammation due to musculoskeletal disorders. It is also used to alleviate pain associated with equine colic. Banamine may also be used for purposes other than those listed. Banamine is a prescription medication FDA approved for use in horses. What should I discuss with my veterinarian before giving Banamine to my horse? Do not use this medication in animals allergic to it. Talk to your veterinarian or pharmacist before giving any prescription or over the counter medicines. Tell your veterinarian if the animal is using any other anti-inflammatory medication such as NSAIDs (phenylbutazone) or corticosteroid (dexamethasone). How should Banamine be given? Use this medication exactly as directed by your veterinarian. If you do not understand the directions ask the pharmacist or veterinarian to explain them to you. The usual dose of Banamine injectable in horses for musculoskeletal disorders is 0.5 mg/lb of body weight administered I.V. or I.M. once a day for up to 5 days. For pain associated with equine colic the usual dose is 0.5 mg/lb of body weight administered I.V. or I.M. once a day. I.V. administration is recommended for prompt relief. In some instances a second or third dose may be necessary. 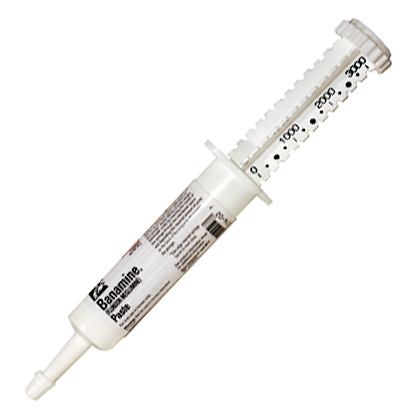 The Banamine Paste Oral Syringe is calibrated in twelve 250 lb weight increments and delivers 125 mg for each 250 lbs. One Oral Syringe will treat a 1000 lb horse once a day for 3 days, or three 1000 lb horses once. 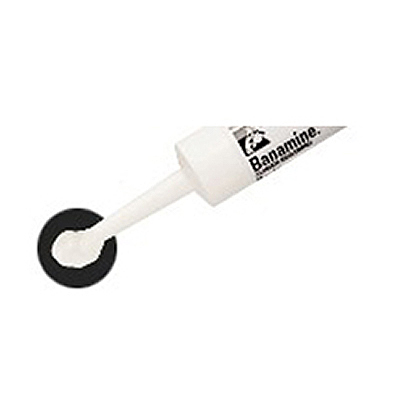 Store Banamine injection and Banamine Paste Oral Syringe at room temperature. Keep this medication out of the reach of children and pets. What are the potential side effects of Banamine? In horses, isolated reports of localized reactions following I.M. injection, particularly in the neck, have been received. These include localized swelling, sweating, induration, and stiffness. In rare instances in horses, fatal or nonfatal clostridial infections or other infections have been reported in association with I.M. use. In rare instances, anaphylactic-like reactions, some of which have been fatal, have been reported, primarily following I.V. use. What happens if I miss giving a dose of Banamine? What happens if I overdose my horse on Banamine? If an overdose is suspected, seek emergency veterinary medical treatment. What should I avoid while giving Banamine to my horse? Do not give Banamine to animals allergic to it. Do not administer Banamine if the animal is also being given an NSAID such as aspirin or phenylbutazone. Avoid intra-arterial administration of this medication. Side effects due to intra-articular injection can include ataxia, incoordination, hyperventilation, hysteria and muscle weakness. These signs are transient and disappear within a few minutes. What other drugs will affect Banamine? Before giving Banamine, tell your veterinarian if your horse is being given an oral steroid medication such as prednisone, prednisolone, Methylprednisolone or NSAIDs such as aspirin or phenylbutazone. Drugs other than those listed may also interact with Banamine. Banamine Paste is an analgesic and anti-inflammatory medication used in horses. Banamine Paste is used to alleviate pain and inflammation due to musculoskeletal disorders. It is also used to alleviate pain associated with equine colic. Each Banamine Paste Oral Syringe is calibrated in twelve 250 lb weight increments and will treat one 1,000 lb horse once a day for 3 days or three 1,000 lb horses once. Each 250 lb weight increment delivers 125 mg of Banamine. Do not give Banamine Paste to a horse already being given another NSAID such as aspirin or phenylbutazone. 0.5 mg/lb of horse's body weight given once a day for up to 5 days. The paste is given orally by inserting the nozzle of the syringe through the interdental space, and depositing the required amount of paste on the back of the tongue by depressing the plunger. 0.5 mg/lb of horse's body weight given once a day. The paste is given orally by inserting the nozzle of the syringe through the interdental space, and depositing the required amount of paste on the back of the tongue by depressing the plunger.